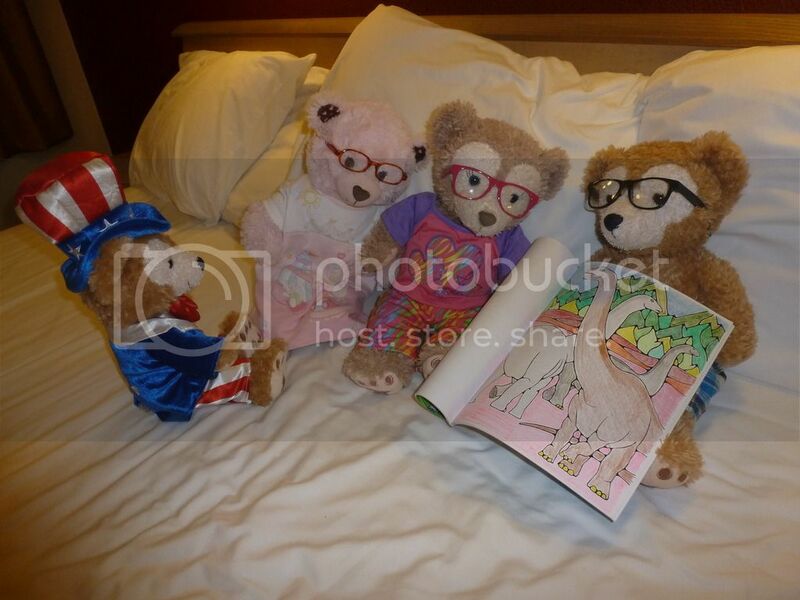 Wow, JillT, Aluki is one smart bear indeed! 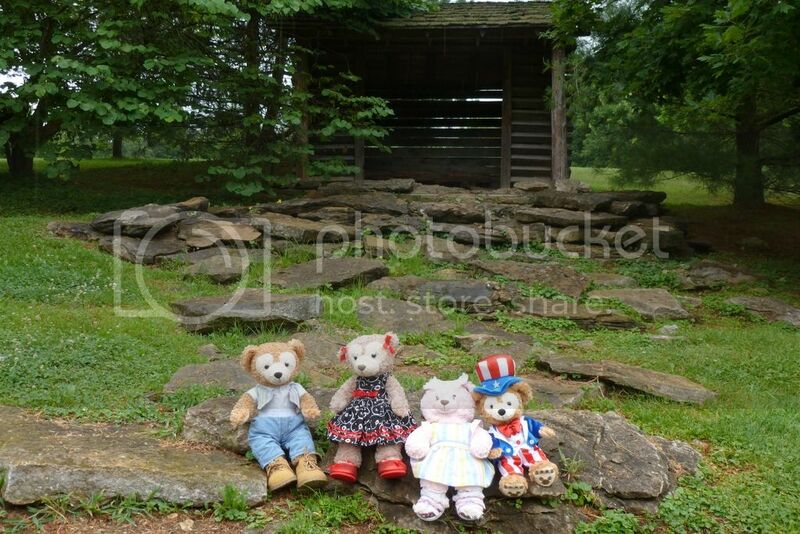 You can see how it is scaled for the S-size bears, not the SS-size. 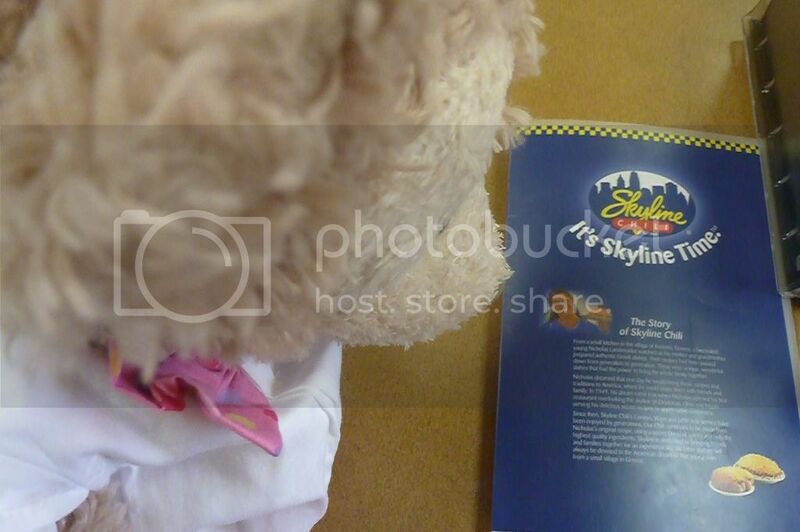 But Shellie May still enjoyed it! 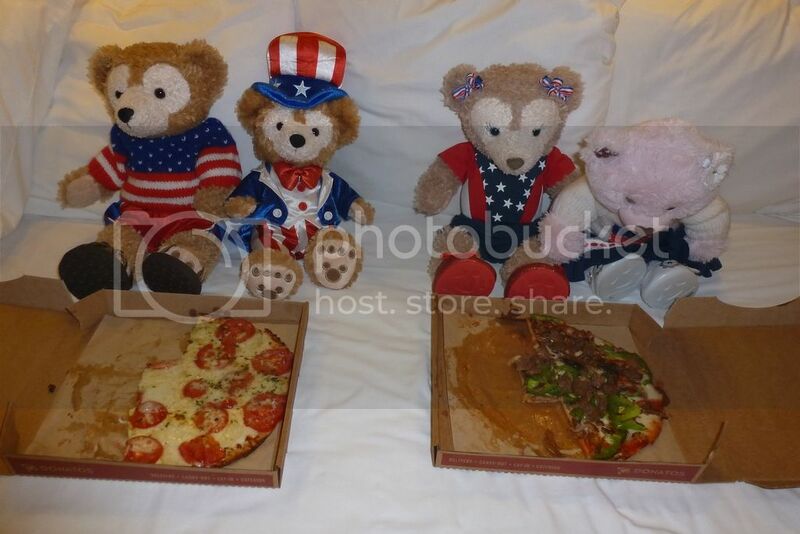 What better way to assimilate Francesca than to invite her on a vacation over Independence Day. 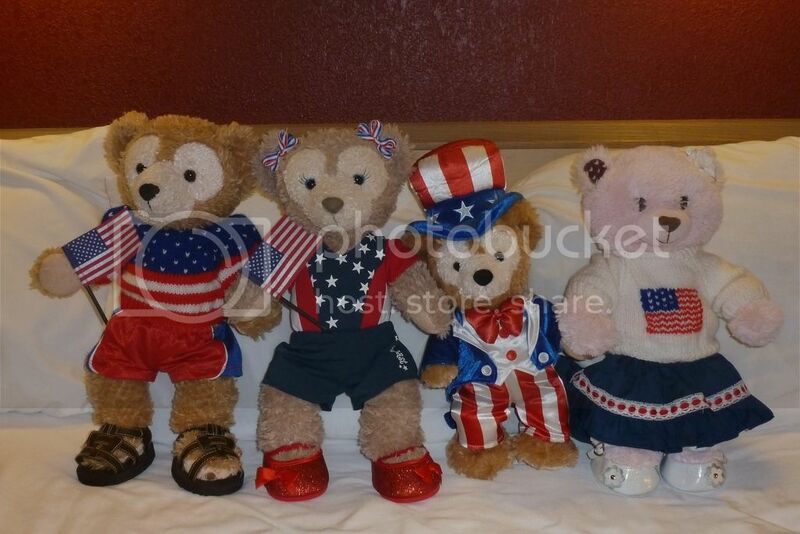 And of course, I must take Patriotic Duffy, who is dressed for the occasion. 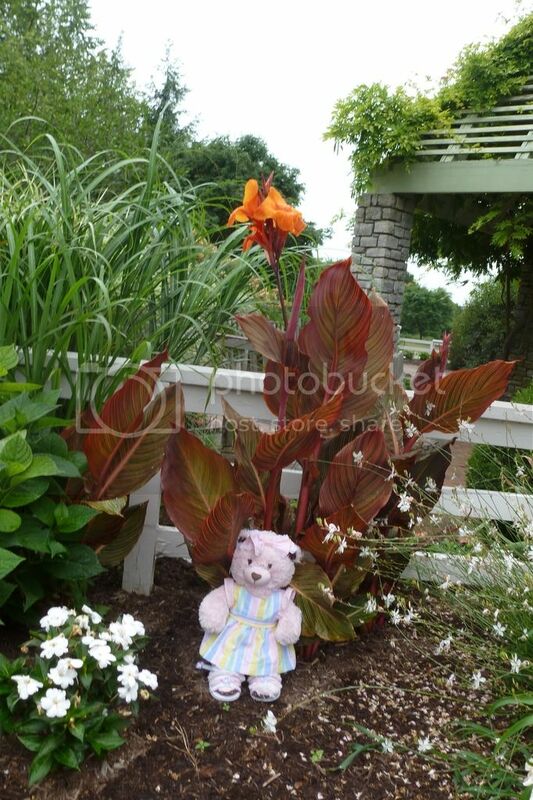 Last time I went on vacation this week (2013) he stowed away (MN/WI). A week and a half ago I found out about the adult coloring book hobby sweeping the world (actually, it's also quite popular in France and in England). In talking to my sister, people at work, and friends, they all have heard about it and know people who are coloring for at least the last 2 years! So with the Amazon credit I got from an ebook lawsuit, I decided to try the hobby. If we get rained in, we will have plenty to choose from. 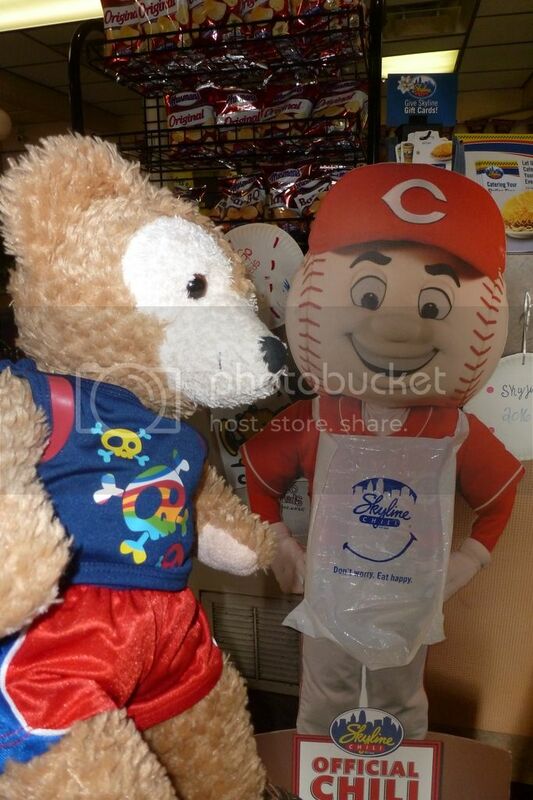 Then we stopped at the Fayette Mall in Lexington, KY.
"Regardez ici!" said Francesca (look here) who still reverts to French when she gets excited. 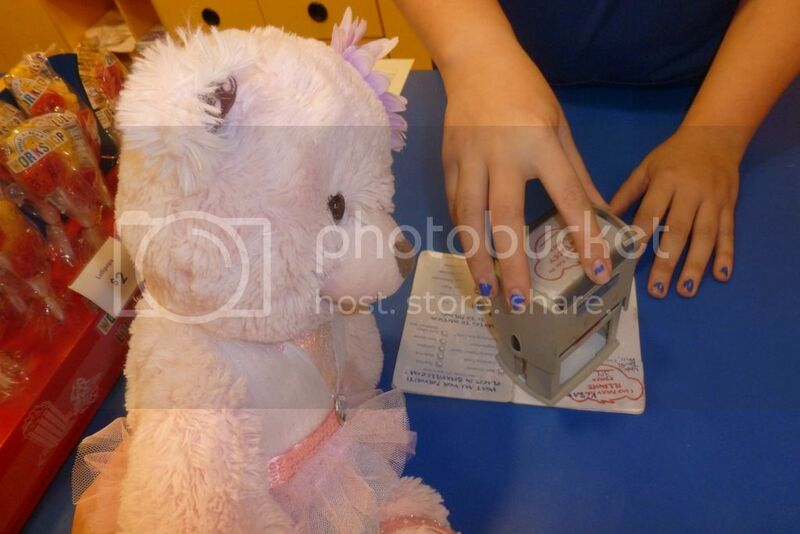 Since she was the only Build-A-Bear on the trip it was fitting that she get the pawsport stamped. I posted some flower pictures first but alas, it looks like they will either show up later (I got the typical "unapproved" message before it went into the bermuda triangle) or they will just never show up. I can't figure this system out. Sunday, well, and alot of the week, there was rain. 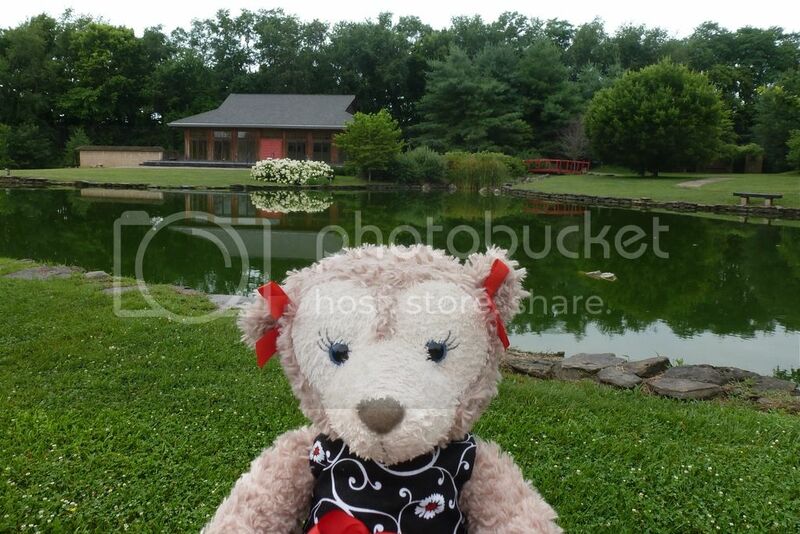 It wasn't a total washout on this day so we decided to go to the Kentucky State Arboretum in Lexington. 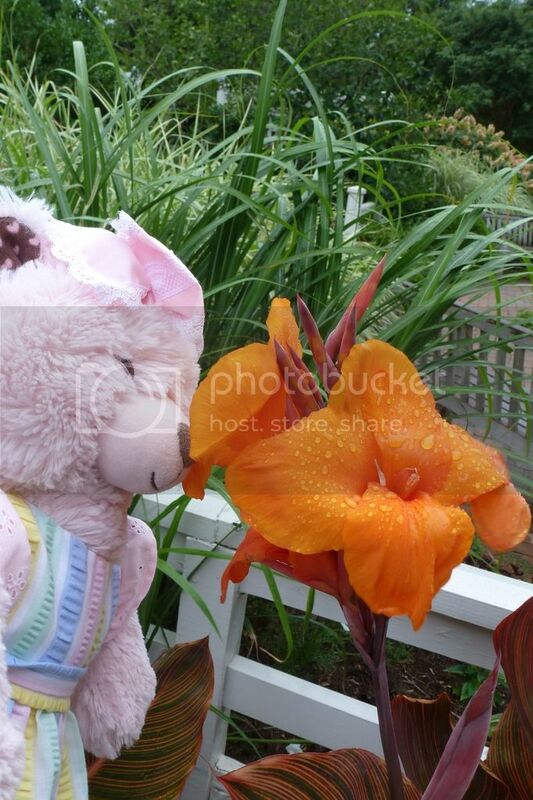 Undeterred by the rain, Francesca smelled this flower. Still undeterred, she then wanted her photo in the mud in front of it. Well, that didn't last long. 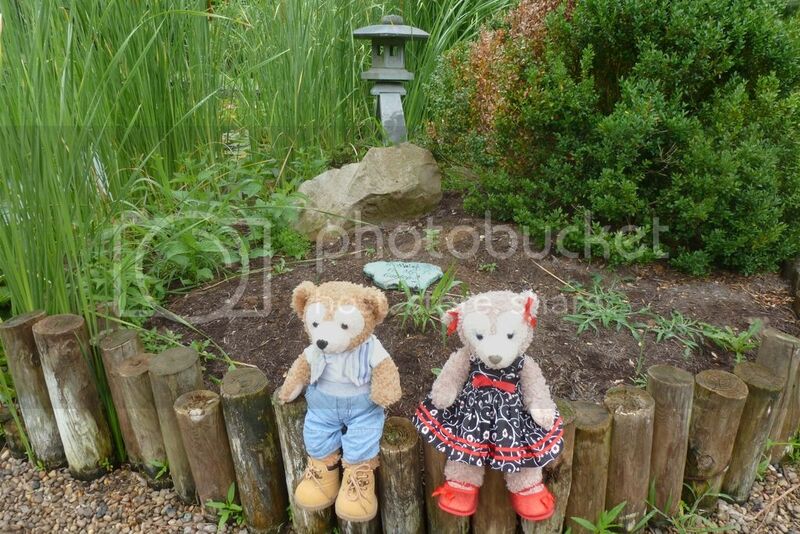 Next I tried to post a few pictures of the Japanese garden we visited and it went into the Bermuda Triangle again. Okay, let's see if I can outsmart the system by editing my post and then inserting the pictures. 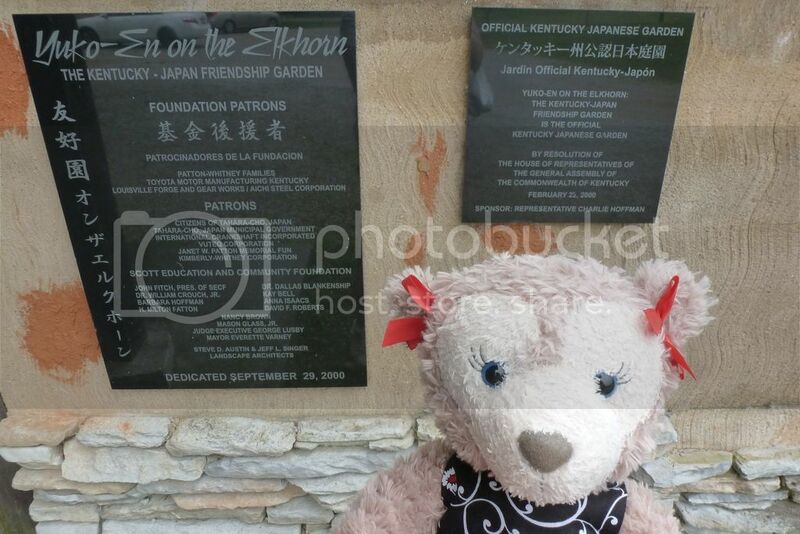 Next we went to Yuko-En on the Elkhorn in Georgetown, KY, about 20 miles north of Lexington. It is the state Japanese garden. 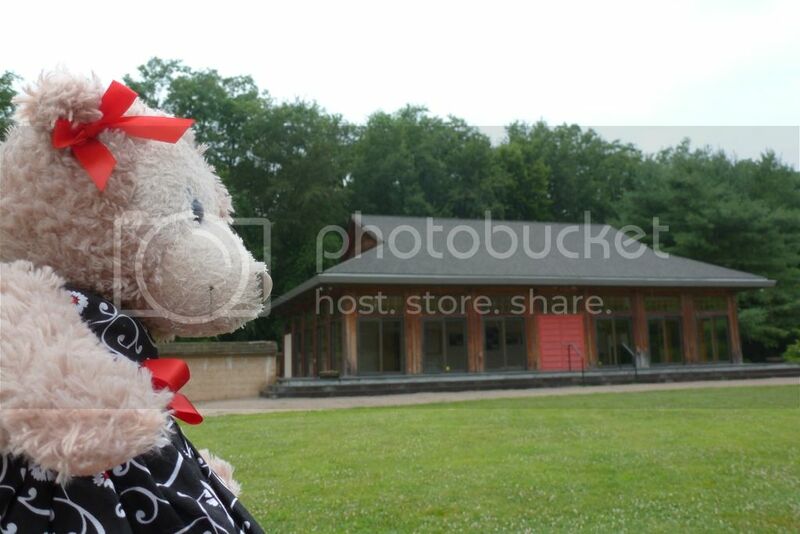 Of course, now Shellie May wanted her photo taken. Ding, ding ding, we have a winner! There's more than one way to skin a cat (ew, something my Mom would say). 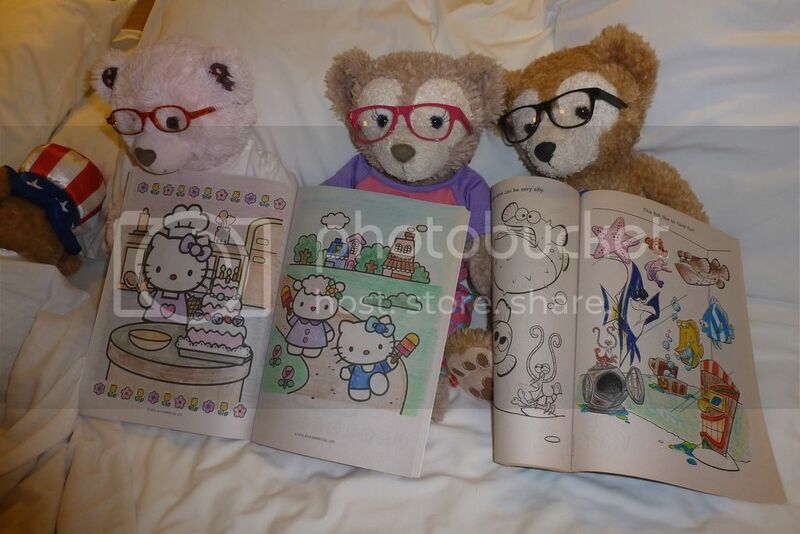 We got back to the hotel and still had alot of the day left so I broke out the coloring books. Da bears each chose their favorite. Crayons make me happy, and I also brought 120 colored pencils, 120 gel pens, and 120 water markers (which we ended up not liking; I'm ordering some alcohol markers instead for next time). The water based markers make the paper pill although to their credit, the nibs (point) hold up well so I'll use them for my writing projects. 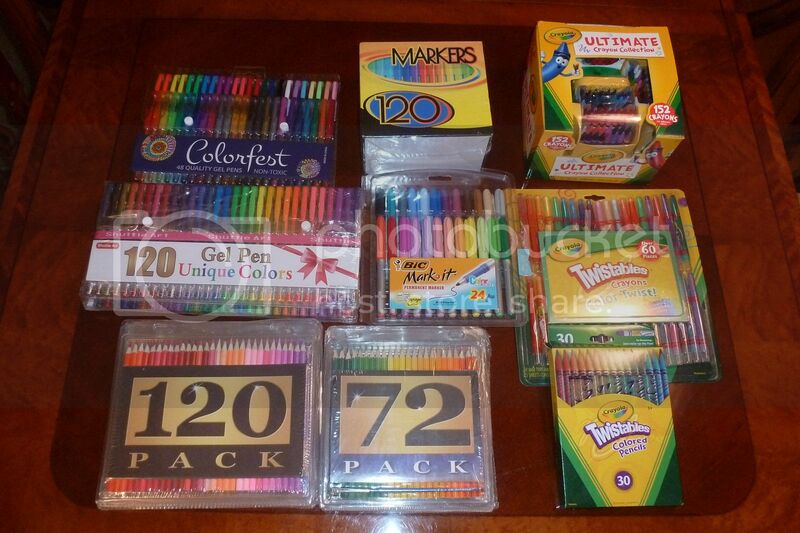 When I was a child the most crayons available were the 64 count box, but now that they have 152 colors I'm EXTRA happy! 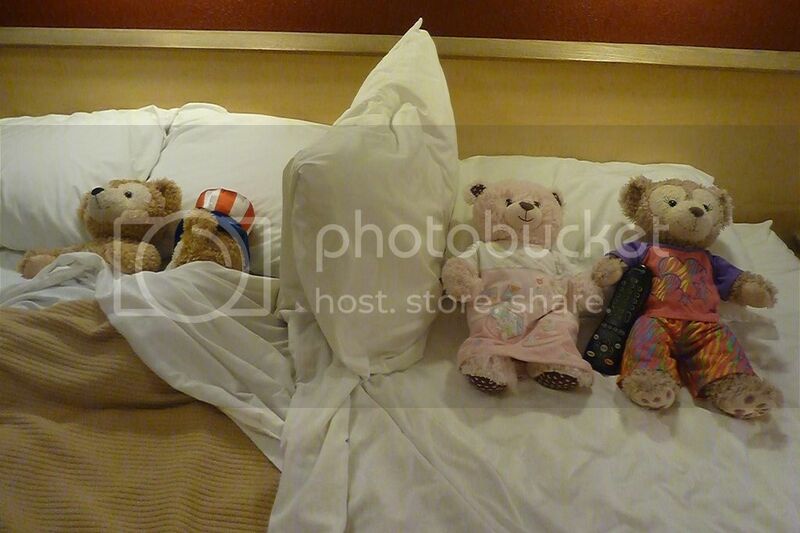 "If you are happy, I'm happy," said Duffy, as he reached for them. 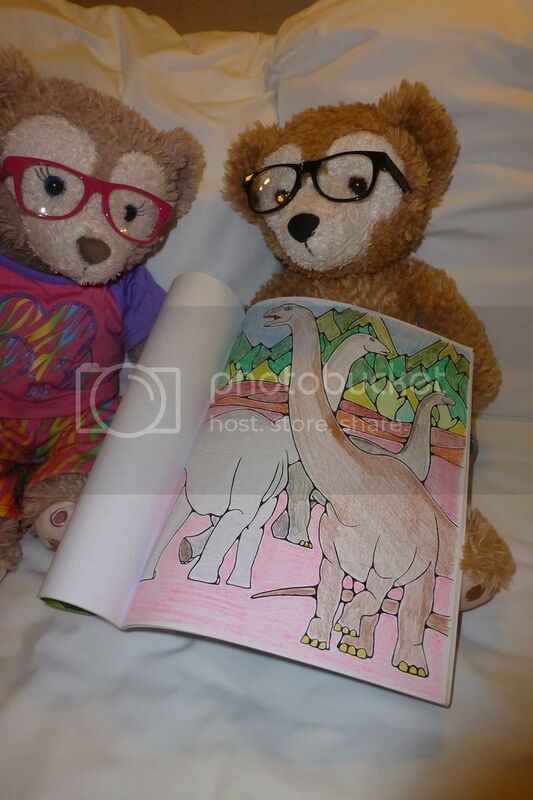 Neat coloring books JillT! I have a large collection myself. There used to be a seller on eBay who was selling the Golden Book archives and I bought several vintage Disney and other character books from him. I also like books from Dover publishing. I make copies of the pictures I want to color so I don't mess up the books. As for art supplies, Prismacolor pencils are some of the best colored pencils you can buy. They are expensive, but I think Target has some of the smaller sets in tins. 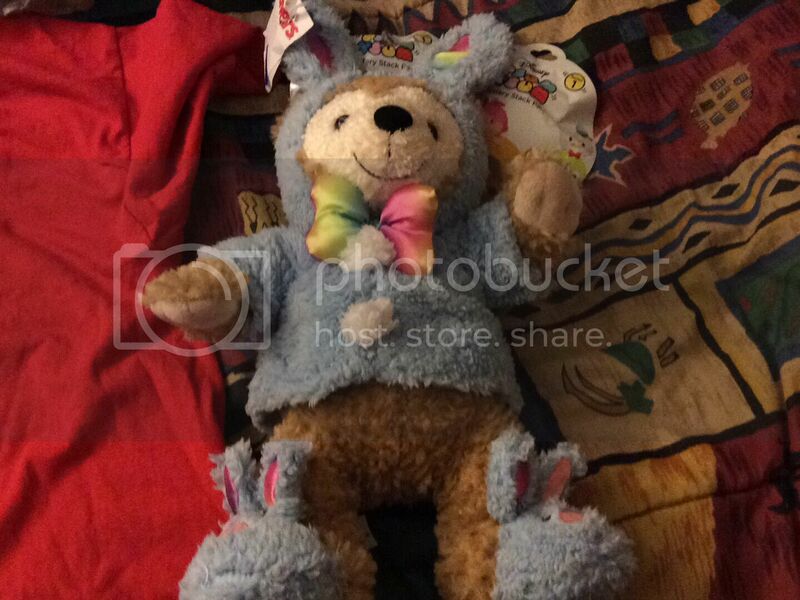 Micheal's carries them as well (and for sure Amazon) The colors are bright and vibrant. I have a set from the 1990's and they still are in great shape. I haven't found any markers (other than Sharpies) to my liking yet. The ones I would love to have (Coptic) cost a small fortune because they are for professional artists. I have a set from Stadeleter (spelling likely incorrect) from Target that is very nice but they are fine point and probably not suited for heavy coloring. Best not to go real cheap on markers because they can pill the paper or bleed through. 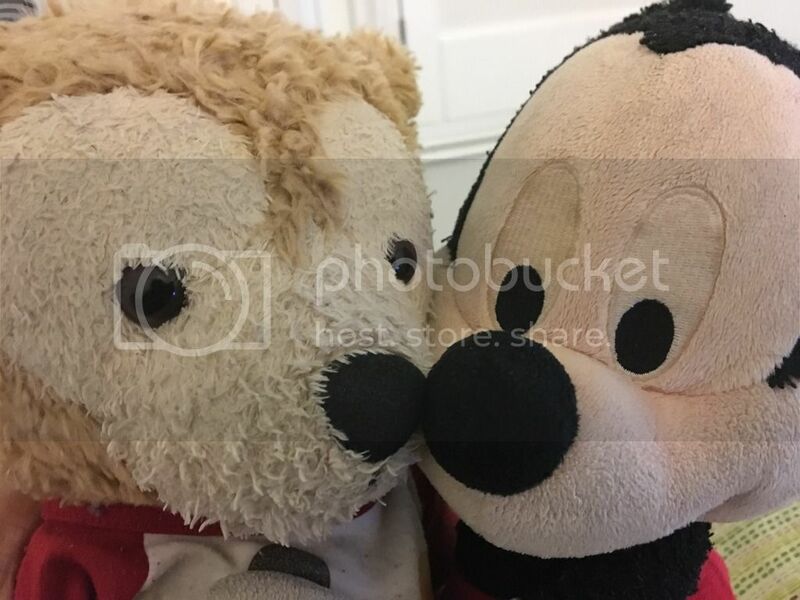 Nice Father's Day photo, MikkiMausu! JillT, I am so glad you are back in business posting, even if it took some ingenuity on your part. 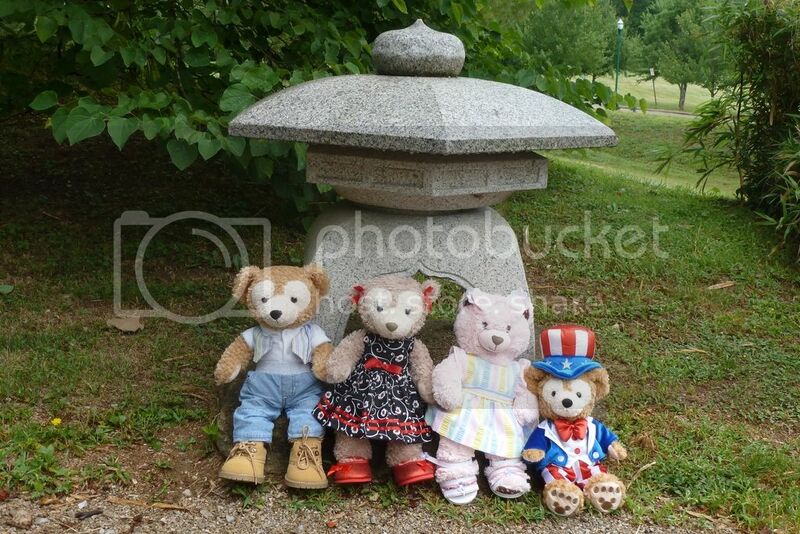 I love the Japanese Friendship Garden (Kentucky + Japan...who knew?). 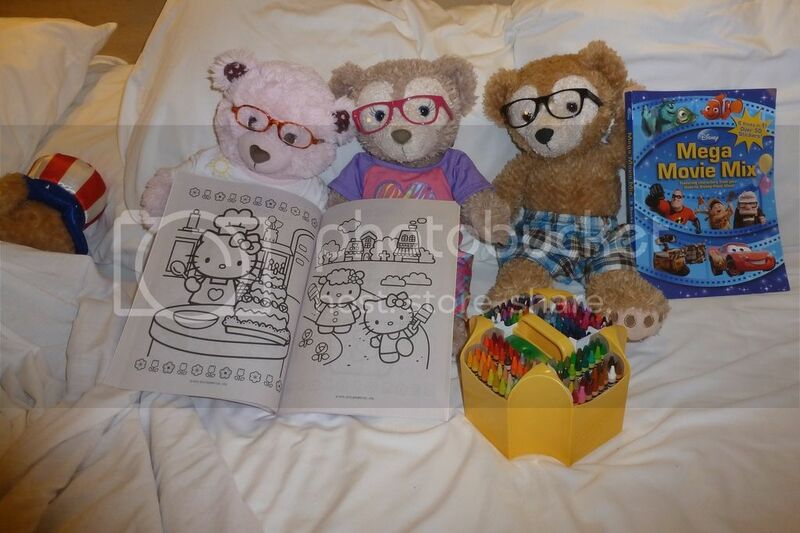 And your bears picked out such perfect coloring books to use! Nicely done! Dazyhill, try Artists's Choice brand on Amazon. Their colored pencils are great and also their gel pens. There are some people on Amazon selling copic knockoffs. I'm getting the daiwaya brand (or something like that). People give it good reviews (alcohol markers). I like some of the Dover books. Unfortunately, I don't have a working printer so I prefer books that just have pictures on one side and then I just go for it (I can print at work but only sparingly). Colored pencils have come a long way since I was a child when they were scratchy and hard. Last edited by JillT; 07-15-2016, 03:00 AM. Independence Day dawned with flash flood warnings and torrential rain coming down in a sheet where the hotel gutters couldn't even keep up. 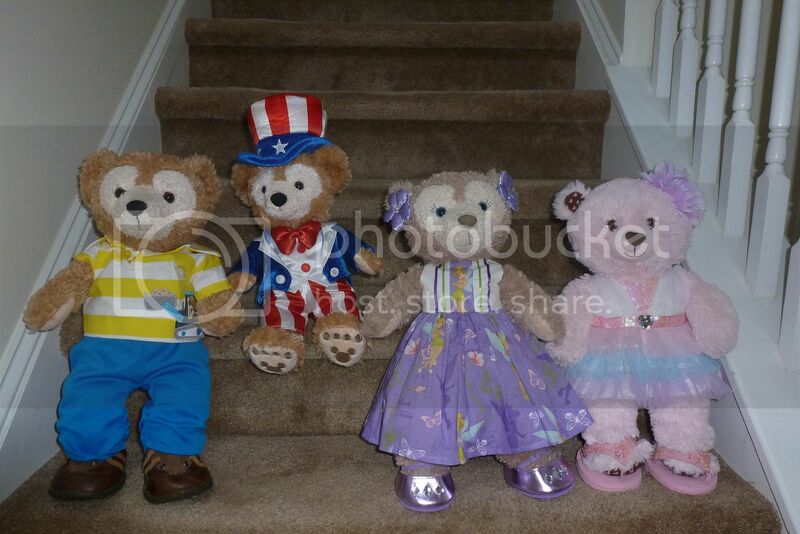 Da bears dressed up anyway. 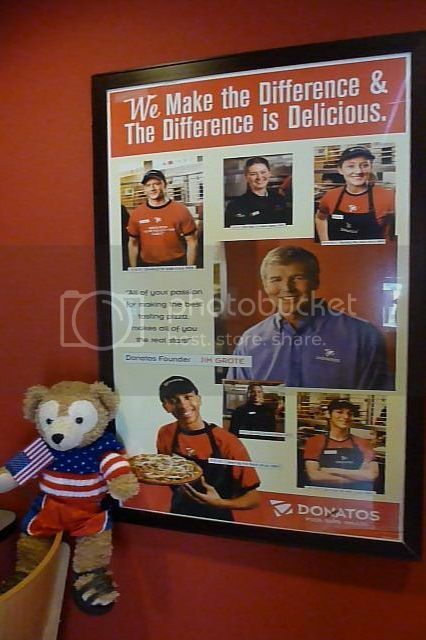 In between downpours there was a Donato's pizza 1.3 miles from the hotel so we went to that. 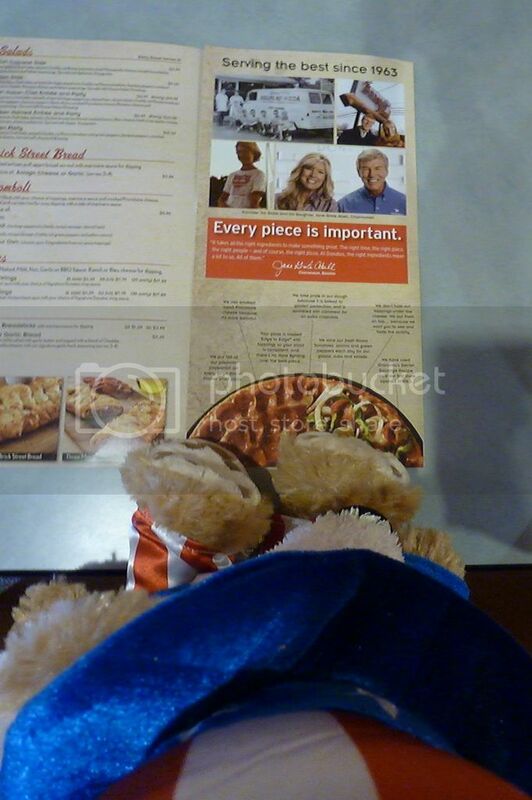 They're known for their thin and crispy pizza. It was so good I ate there 4 times. 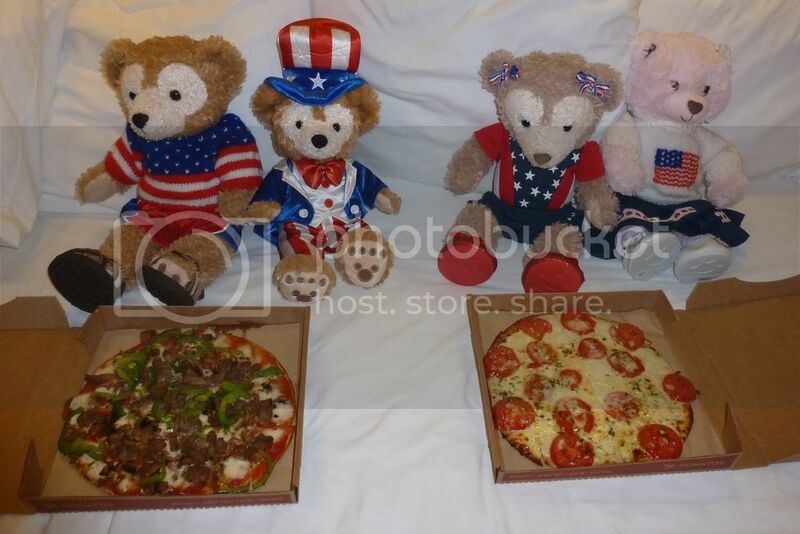 First Duffy and Patriotic Duffy started with ground beef, green peppers, and mushrooms, while the girls got a margherita pizza. Francesca started singing, "I'm all about da pizza, da pizza, da pizza," as she stuffed her face and they switched flavors. 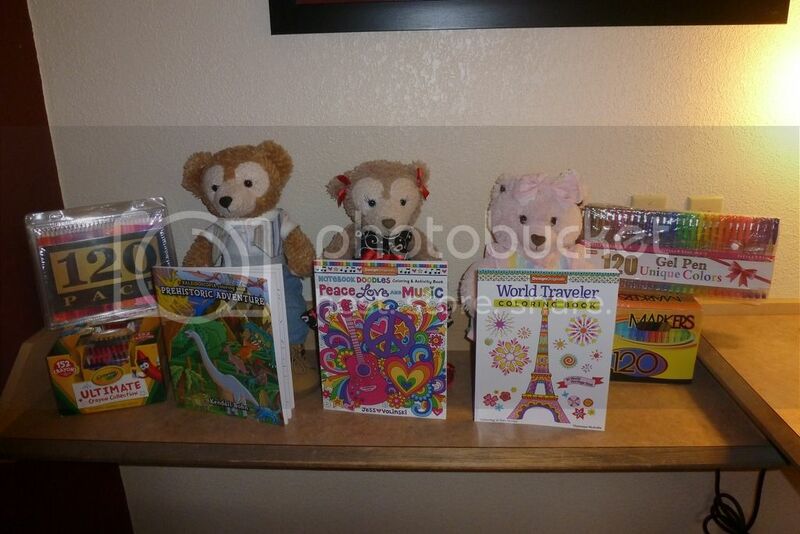 Since it poured rain I brought some of my French CDs and the coloring books. 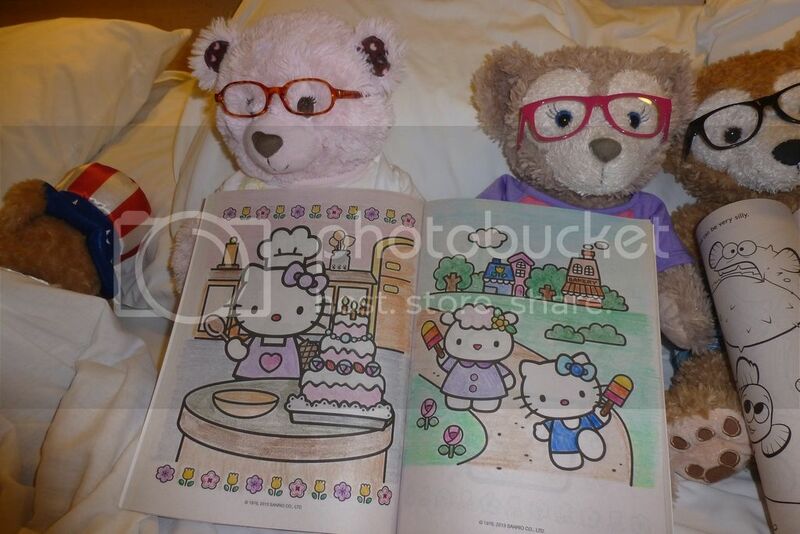 Shellie May and Francesca had analysis paralysis from all the pretty pictures and utensil choices. They were afraid of messing up a picture and not having another chance. Shellie May was even watching coloring instructional videos on youtube. "This is supposed to be relaxing and fun, not stress you out," I told them. "Why don't you mark all your favorite pictures and I will scan them in and print them at work and just color one of your non-favorite pictures to get some practice," I told them. "Will you use copy paper or GOOD paper," asked Shellie May. "Well, we have better than copy paper but I can't be buying card stock. My boss would figure it out so I sort of have to do it on the sly," I told her. 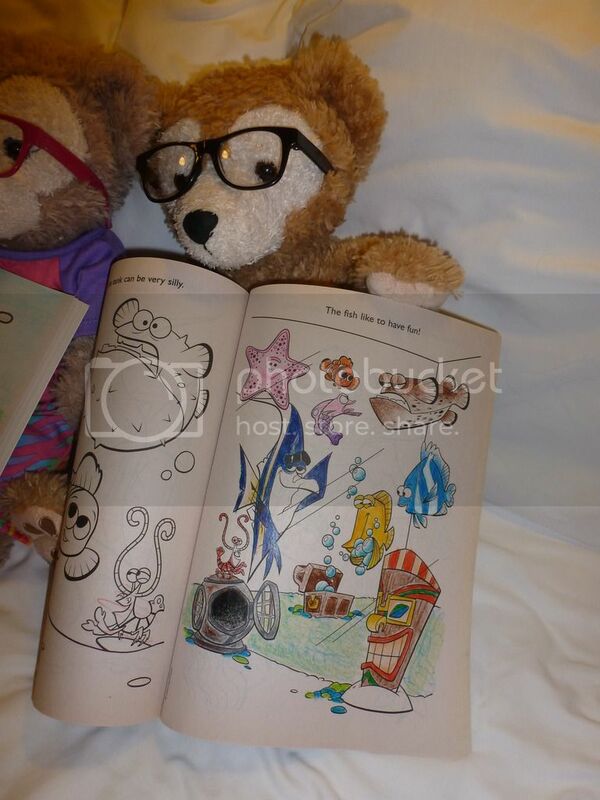 Meanwhile Duffy showcased his crayon picture. "See? It's easy!" "Why are YOU wearing glasses, now Francesca?" 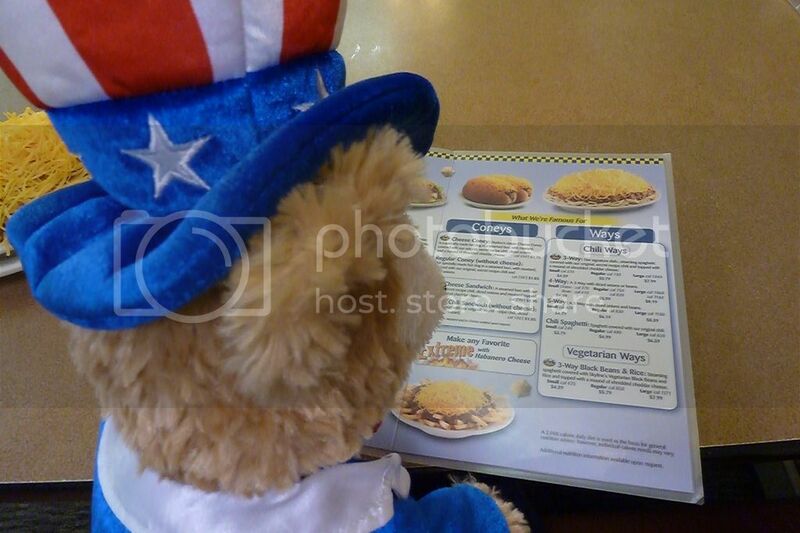 asked Patriotic Duffy. Shellie May answered for her: "the better to see things with." "Meh, I don't want to color," said Patriotic Duffy defiantly. "Don't worry. 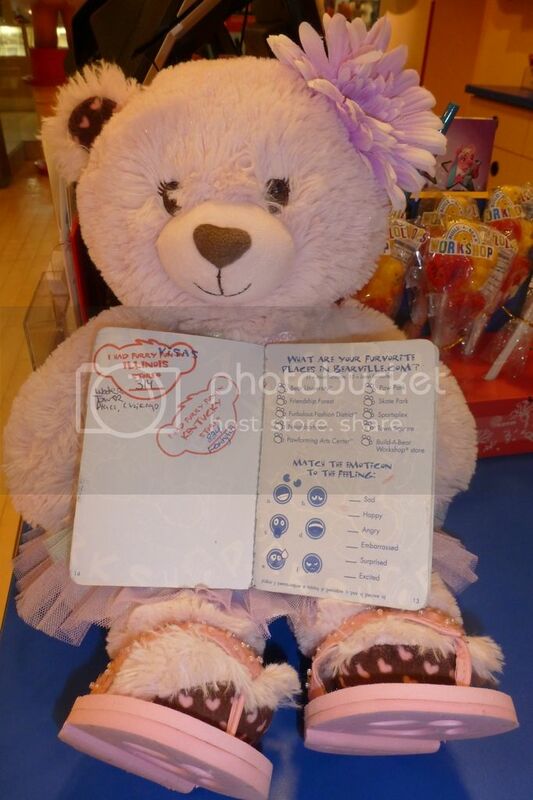 Have a crayon and be happy," Duffy told Shellie May. It is a good thing I bought some children's books at the dollar store. Patriotic Duffy did not want to color and took a nap instead. 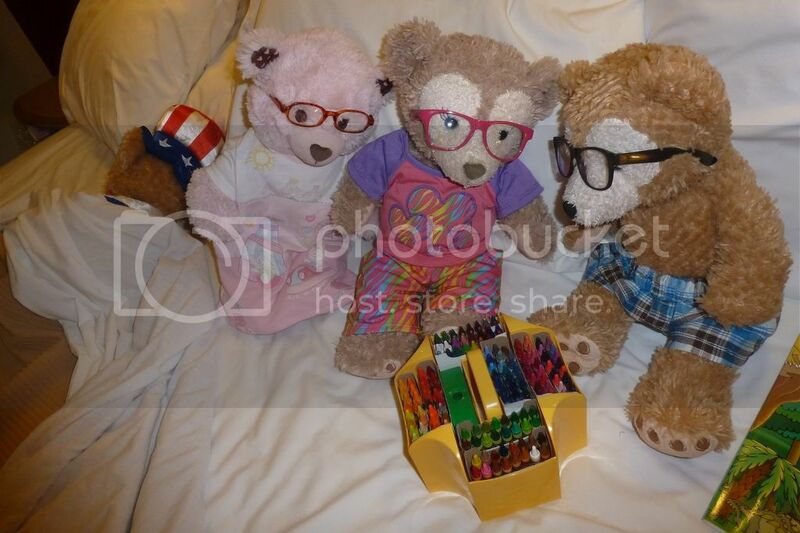 Shellie May and Francesca took Duffy's advice and used crayons while Duffy had graduated to mixed media (crayons and pens). Shellie May was still a little wired up so she watched TV. Last edited by JillT; 07-17-2016, 07:46 AM. Thanks for the marker recommendation JillT! I think I will buy a smaller set and see how I like them. Need to find that Mega Pixar mix book-looks like a lot of great pictures. I got the book from ebay. It has 6 movies in it. Tuesday we started the day in Covington, KY, which has a mainstrasse village (German section). 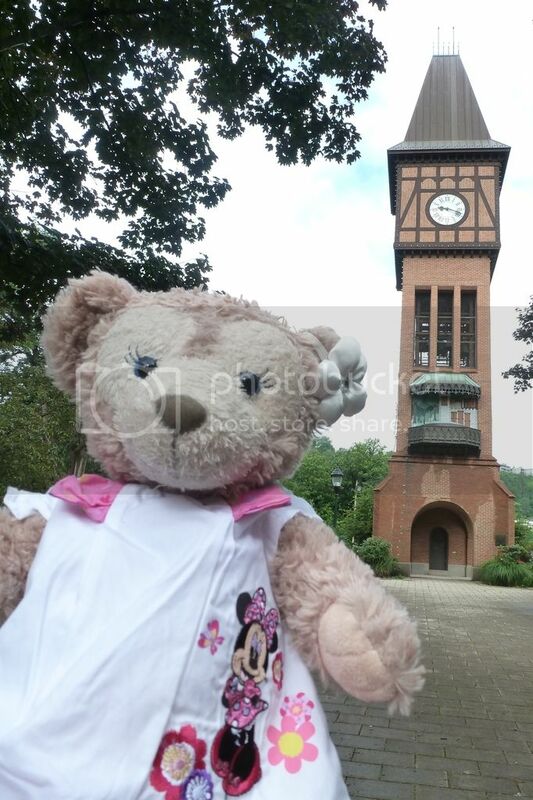 Here is Shellie May at the glockenspiel (clock tower). 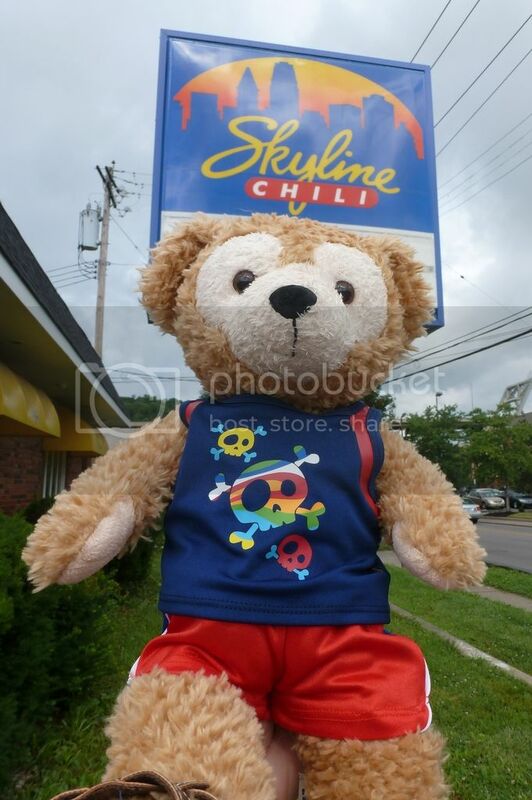 Duffy, always ready to eat, was more interested in Skyline Chili. They serve Greek chili, and yes, it is authentic; the Greeks really do eat chili. The secret ingredients are a hint of chocolate and a hint of nutmeg. I don't like nutmeg or all spice or cloves, but I heard alot about this place so we decided to try it. Covington, KY is just over the river from Cincinnati, and this is the official chili of the Cincinnati Reds. "We haven't been to Ohio yet and Cincinnati is JUSTTTT across the river, 2 minutes away, HINT HINT," said Shellie May. I've seen enough of Ohio but I did take da bears over the river, turned around, and came back just to humor them. 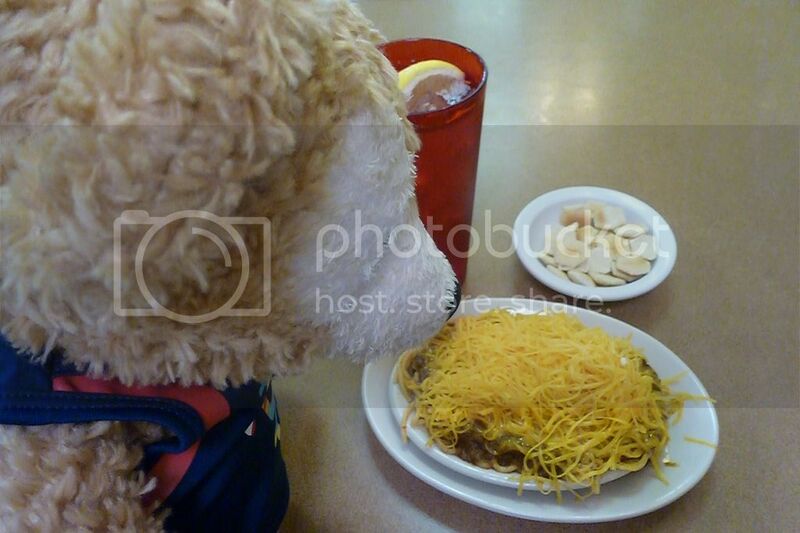 You can get your chili on a hot dog or over spaghetti with cheese, beans, and/or onions. We got it over spaghetti with cheese. It is good quality chili and not greasy from the meat at all. The nutmeg was subtle and grew on me, although I can't say I'd make a special stop for it again. 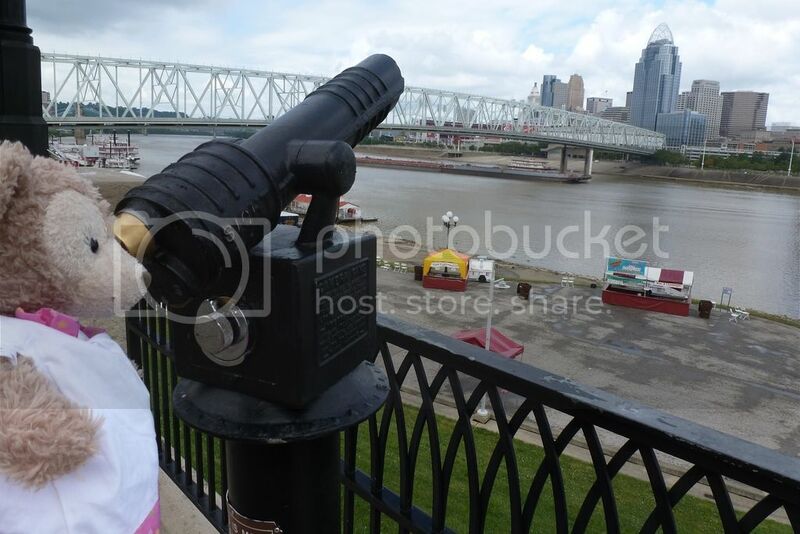 Then we went to Newport, KY, at which point Shellie May longingly looked across the river at Cincinnati. She didn't think the drive across the river and turning around counted for her seeing Ohio. I agree, but sorry, bears, we have a full itinerary today and I don't want to be distracted spending time in Cincinnati.